I ran the San Francisco Half Marathon today. Big props to Alex Bain for motivating me along the way. 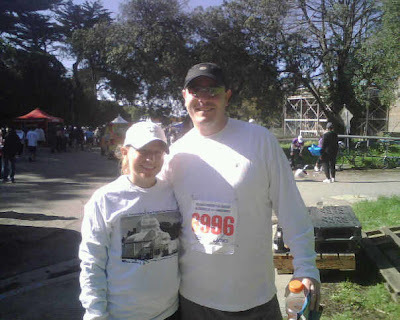 He set up such a simple running program that it was easy to train for the race. Here's a picture of Megan Coles and me after the race. I got separated from Bain & Crew during the race so I didn't make theirs. Thanks for the song suggestions, Beckers! Ran across the line listening to "Stand Up Against Cancer" for my girl Lauren.